How Do Air Cooled Air Conditioners Work? 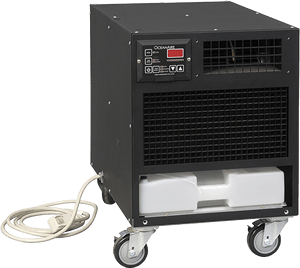 Air cooled portable air conditioner units use ambient air and convert it to cool air with internal condensers. These units require the use of air ducts to extract hot air from the unit and expel it from the room, so an air cooled air conditioner requires a means of ventilation.Typically, these portable air conditioner units are ventilated through a window. It is also common to extract hot air via a ‘floated’ ceiling where the hot air can be dispersed and not re-enter the room. Other ways of ventilation include through doorways, into garages or into any room which does not require cooling.Large air cooled portable air conditioners are often used outdoors and utilize duct work to bring cold air to a desired location. Our clients utilize this type of air conditioner for weddings, concerts and other outdoor events. 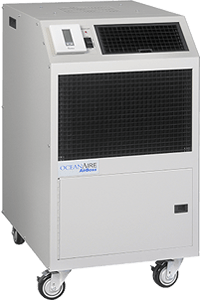 The OceanAire PAC Series are portable air-cooled spot coolers designed for permanent or temporary cooling applications.The PAC models range in cooling capacities from 12,000 BTU/HR to 60,000 BTU/HR to satisfy most space cooling requirements. 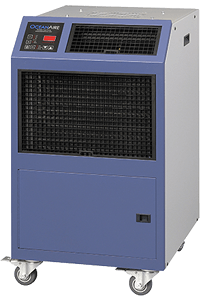 The PAC is a self-contained unit with the entire cooling system, evaporator and condenser fan motors and electrical components neatly arranged in a gray polyester powder coated metal cabinet.